My friend Helmut Veith passed away on Saturday, 12 March 2016, from the effects of a pulmonary embolism after an operation on his leg. He was 45 years old. Helmut is survived by his wife Anna, their son Nikita, and his mother Herta. Our thoughts are with them. I leave it to others to honour his pioneering achievements in the field of computer science. With this text I intend to recognize his outstanding abilities as science communicator. It sounds trivial to state that Helmut Veith led a binary life. As a computer scientist Helmut would deal with decisions described by yes and no, plus and minus, 1 and 0. But If I say binary and mention Helmut I add the attribute of quality to this binary decision-making. Helmut was a man of a distinct “Möglichkeitssinn” in the sense of Robert Musil, an author–among many others–he loved as Richard Zach reminded us in his befitting obituary. Options, chances, possibilities do not describe properly what fascinated Helmut when faced with a problem. It was the potential the problem offered and which he detected with his “Möglichkeitssinn” which Musil explains as follows: “A possible experience or truth is not the same as an actual experience or truth minus its ‚reality value’ but has–according to its partisans, at least–something quite divine about it, a fire, a soaring, a readiness to build and a conscious utopianism that does not shrink from reality but sees it as a project, something yet to be invented“ (Musil 1996, p.11). For Helmut, the answer to a riddle was wasted (or at least bland) if the answer did not enable new paths of thinking, new fields of research, new ways of communication. A solution was not the simple confirmation of feasibility but a proposal for improvement. 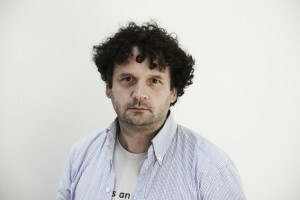 His peers have described Helmut’s merits as a computer scientist in an appropriate manner. I will focus on his interest in communicating his science to all kinds of public. His unique quality to strive for improvement contributed to Helmut’s decision to wade into the sphere of communication–including the option of failure. Let me illustrate this with our first collaboration: obviously, just putting out a press release on the establishment of a network bringing together all Austrian research groups involved in Rigorous System Engineering was not enough for him. It had to be more like convincing the Austrian public that Turing Award winner Ed Clarke who had travelled to Austria for the kick-off meeting of the new platform was headline stuff. For the press conference with Clarke in March 2011 not only the president of the Technical University of Vienna was convinced to participate but also the federal science minister. A trendy location with a good selection of food and wines was chosen and the time set in such manner that the journalists could use the press conference as their first watering hole after that day’s deadline. The evening nevertheless ended in a disaster. In short: Ed Clarke and Rigorous System Engineering could not compete with Fukushima that had blown its fuses and the headlines twelve hours before. The reason why this first joint attempt in communication did not fail was a media workshop a couple of months before the press conference. Helmut had first supported and then pushed (including supplying his own coffee machine for the coffee break, if I remember correctly) the, at least for Austria, new idea of this workshop. At this workshop in 2010 at the TU Wien he–and other scientists he had led by example–offered a carefully selected group of journalists the most precious commodity they had available: time and attention. The effort paid off. In spite of the Fukushima disaster, Rigorous System Engineering made it into the editorial offices and continues to do so. the insight that with promoting a specific field of science we also communicate science as such. Some hyperbolic ideas worked, like convincing the editors of Austria’s leading current affairs publication profil not only to produce an extensive report on the “most important field of science in the world” (what else?) but actually to put 21 logicians working in Austria on to its cover. Some other hyperbolic ideas didn’t, like convincing the local district assembly at very short notice to name a street after Kurt Gödel. By the way, as an act of acknowledgement of Helmut’s achievements this should be rectified in due course. Maybe the Logic Lounge summarized Helmut’s intentions in the best manner: a meeting place for friends of logic in the very public of a trendy club in the centre of Vienna offering “insights into the millennium old discipline of logic, celebrating the antique concept of the philosophical symposium (from Greek συμπίνειν sympinein, ‘to drink together’)” as we wrote on the website, hosted not by an expert but an interested person, most likely a journalist able to bridge the gap between the scholar and the public. 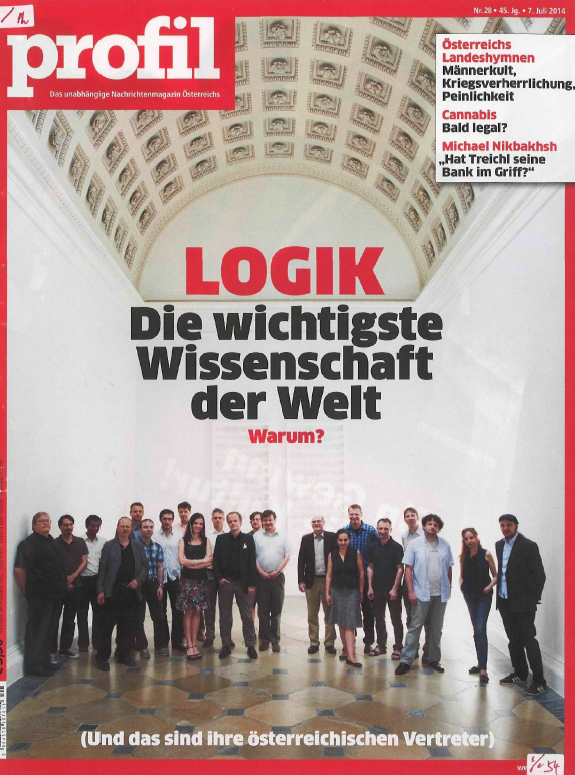 The subjects ranged from the history of logic at Vienna universities in the 1980s presented by Georg Gottlob with surprise appearances of veterans like media artist Peter Weibel to Christos Papadimitriou on his graphic novel and NYT bestseller “Logicomix”, Moshe Vardi on the ethics of AI, Richard Zach on Gödel’s incompleteness theorems, Byron Cook on the logic of symbols and, finally, Ruzica Piskac, Magdalena Ortiz and Irene Schreier Scott on female logic. It is fair to assume that science communication in Austria cannot go behind this conference and its events in terms of intellectual capacity, diversity, accessibility and cultural impact. I am skipping numerous other ideas in different degrees of realization like re-writing first the textbooks and then the curriculum for high school students after examining the teaching material in maths with which his son had been supplied or the support of developing “Informatik Austria”, again a network of research groups in computer science, for which Helmut generously sacrificed his time and creativity. And Helmut was equally generous when it came to support ideas of others. Of course, his Vienna Center of Logic and Algorithms participated in the Vienna Ball of Sciences from the very first moment onwards, with Helmut explaining the impact of probability and game theory at the roulette table. The idea of the ball was a setting proper to his liking: think big, think better, and do not refrain from challenging common expectations or attitudes. Finally, I wrote the first draft of this text sitting in the Café Wortner close to his office at the TU where Helmut and I had wanted to meet to discuss another idea: The Südbahn-Hotel had gone up for sale. Why not convince the federal ministry, the Austrian universities, and the provinces of Lower Austria, Styria and Vienna to acquire this inspiration for the “Grand Budapest Hotel” and turn it into a meeting, retreat, vacation and conference space for interdisciplinary research in central Europe? Heck, why not? to motivate the public in the context of the societal concept of participation to become a part of an enlightening sphere where visions are welcome, problems can be handled, conflicting opinions merged for improvement of the status quo, and ideas ventured without fear. Edit 16|06|22: This text has been reprinted in the June 2016 issue of „Bulletin of the European Association for Theoretical Computer Science“, to be found at http://bulletin.eatcs.org/index.php/beatcs/article/view/418. For the pdf of the printed version of the Bulletin go here. Edit 16|03|16: Helmut’s colleagues are establishing an award in his honour to support promising students. Contributions to the Helmut Veith Award can be made to „Zentrum für Informatikforschung“, IBAN: AT36 1200 0515 8258 2701, BIC: BKAUATWW, reference: „Helmut Veith Award“. If you have any pictures of Helmut (with his friends) that you would like to share, please send them to singer@forsyte.at.